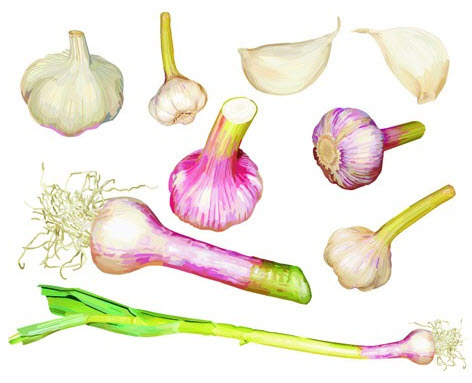 Natural Healing Tools: Vampires Beware: It’s National Garlic Month! Vampires Beware: It’s National Garlic Month! Find out how to use garlic as an organic pesticide, and ways PlantCatalyst® can help gardeners grow this and other crops. Here at Dr. Willard’s®, we love to honor all celebrations, especially ones that bring awareness to ways we can improve our health! We are excited to celebrate National Garlic Month. Garlic has been used for at least 6,000 years around the world, and not just because of its taste (think garlic bread), but also because of its miraculous properties. Garlic contains a host of healthy nutrients, such as protein, vitamins A, B-1 and C, as well as iron, calcium, magnesium and amino acids. Not only does it contain anti-viral properties to keep us from getting sick, but it also has antifeedant, antibacterial, antifungal, insecticidal and anti-repellent properties, which makes it the perfect gardening tool as an organic pesticide. Pesticide is a substance that is used for a variety of different purposes; insecticides control garden pests, while herbicides are used as weed killers. Pesticides are fairly common in the US, where 85 percent of families own at least one form of pesticide. Although it’s easy to pick up a can or bottle of pesticide at a local store, more and more people are finding out about the dangers of using synthetic versions. What are the Dangers of Using Synthetic Pesticides? More and more information is coming out about the dangers of synthetic pesticides. Not only can they lead to a myriad of serious health concerns, such as cancer, Alzheimer’s Disease, ADHD, birth defects, as well as problems for our reproductive and nervous systems, but they also negatively affect our environment. Pesticides may be responsible for disrupting the ecosystem by the runoff that kills fish and other water creatures, polluting groundwater supplies and harming wildlife through a process called volatilization, when the substance turns into vapor or gas, and travels through air, being inhaled by wildlife. Why is Garlic a Better Alternative to Synthetic Pesticides? To prevent the health and environmental concerns caused by synthetic pesticides, yet still control pests and weeds in your garden, turn to organic pesticides, such as garlic. This vegetable is not only much more affordable than store-bought solutions, it is also all natural and contains no toxins. According to a source, garlic will work with healthy soil to attract healthy pests that are needed in your garden, while controlling unwanted ones. What are the Best Ways to Use Garlic as a Pesticide? Remove the outer skin and crush 5 medium garlic bulbs in a garlic press. Mix with a half liter of water and leave to soak for 6 hours or more. Add potash-based soap and strain using a fine cloth into a glass jar, closing with a lid. To use, dilute the mix by adding 4 liters of water, and use immediately at least once a week. Stop spraying a month being harvest to prevent the strong garlic taste from permeating the fruits or vegetables. Nematodes are translucent, unsegmented pests that attack healthy plants. Although they are tiny, about 1/50 inch long, they can cause serious damage to roots, stems and leaves of healthy plants, especially cherry tomatoes, peppers, carrots, corn, lettuce, potatoes, onions, rye, alfalfa and chrysanthemums. To prevent these pests, as well as fungus, from destroying your vegetable garden, use a garlic soil drench. To make, juice garlic, and add 5 gallons of water to half a cup of garlic juice. Spray or water the mixture over the plants. To kill white flies, aphids, spider mites, and other pests, make garlic pepper tea. Blend two garlic bulbs and two hot peppers in a blender while it’s half-full with water. Strain, pour into a 1-gallon container and fill with water. To apply to infested plants, mix ¼ cup with a gallon of water and spray. The best way to utilize garlic as an organic pesticide is to use fresh garlic that has been raised without toxic ingredients. Don’t trust store bought garlic, grow it yourself! To grow healthier, stronger and more abundant garlic, turn to PlantCatalyst®. Our product works with fertilizers in order to help grow crops faster, while increasing germination and strengthening roots! Several studies have been able to prove that PlantCatalyst® can increase germination, strength and yield even if fertilizer use has been cut by 50 percent! Don’t forget to complete your organic gardener’s toolbox with our signature agricultural product, PlantCatalyst®!